While working on the Federal Council of Churches in America Records collection it is not surprising (considering my American Studies background) that I found the materials relating to the Bethlehem Steel strike of 1910 the most interesting. The materials comprise an almost minuscule portion of the collection; only one folder, but I love primary source documents and I love figuring out their relationship to the history they are involved in. It is easy to get distracted while processing a collection on the items that we as archivists personally find interesting, so instead of letting my research only enlighten myself I thought I would write a little bit about the strike and its relation to the papers in our collection. “At its founding in 1908 the Federal Council [of Churches (FCC)] issued its ‘Social Creed of the Churches.’ This statement on the social responsibility of Christians marked only the beginning of FCC’s work in this field. The FCC stood behind such issues as worker’s rights to organize or shorter working hours for American labor.” It is a striking coincidence that the official formation of the FCC in Philadelphia, Pennsylvania coincided with John Andrews Fitch famous sociological study of the working conditions of the steel workers industry (1907-1908) in the other major city in Pennsylvania: Pittsburgh. The steel industry employed almost 80,000 workers in the city and virtually controlled social and civic life. Fitch spent those two years observing steel workers on the job. He examined the health problems and accidents which resulted from the pressure of long hours, hazardous machinery, and speed-ups in production. He also analyzed the early experiments in welfare capitalism, such as accident prevention and compensation and pensions. His book The Steel Workers was published in 1910 the same year as the Bethlehem Steel Strike. 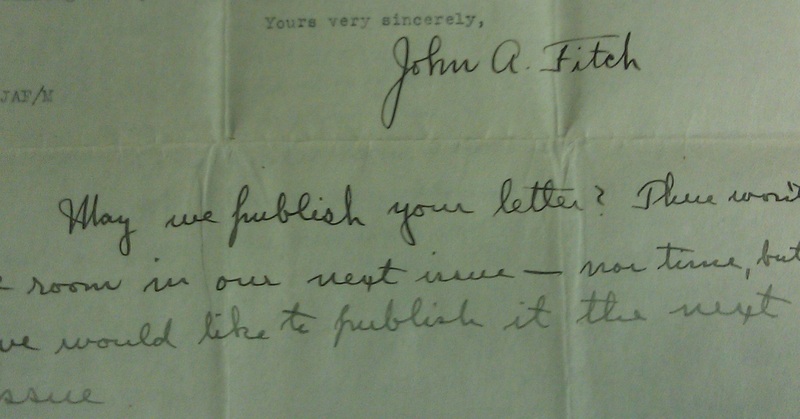 It is interesting to note that included among the papers in the FCC collection are letters of correspondence between John A. Fitch, who was writing an article on the Bethlehem Strike for “The Survey” and Rev. Francis S. Hort, pastor of the First Presbyterian Church and member of the Ministerial Association in Bethlehem. The strike began on February 4, 1910 and lasted 108 days. The workers main grievances revolved around low pay and long hours. They wanted Bethlehem Steel Co. owner Charles M. Schwab to agree to give them Sundays off and to raise the laborers’ pay of 12 cents an hour. They also wanted a change in the “bonus system,” which paid skilled workers so little it forced them to work overtime. After almost a month of striking Schwab still refused to meet the demands and called in the police instead, resulting in a riot after police charged into a crowd of bystanders beating men, women and children. Although the riot galvanized the striking workers for a little while to remain on strike as they attempted to get support from local clergy and national organizations, by early May only a fraction of the almost 9000 men originally involved remained on strike. The U. S. Bureau of Labor began an investigation on March 17 of the Bethlehem strike and on May 4 released its report, which is also located in this collection. It concluded that “over 97 percent of the work force had a work day of 10 hours, and 51 percent worked 12 hours or more. Twenty nine percent of the men worked seven-day weeks with no extra pay for Sunday work.” Unfortunately the report had little effect on changing Schwab’s mind, he allowed the men back to work, but made no changes to the working conditions or the worker's wages. The FCC’s involvement in the strike was to conduct a survey of the situation after the strike was officially over. Under the direction of Dr. Josiah Strong; social reformer, proponent of the social gospel and chairman of the Social Services Commission, the survey was done to determine how best the FCC could serve the steel workers. The survey of the Social Services Commission was not necessarily met with open arms. The FCC collection contains a letter to Josiah Strong and others on the Commission, from the leaders of the Ministerial Association of Bethlehem, Rev. Francis S. Hort, Rev. Paul de Schweinitz and Rev. G. Schwede. They state, “The recent strike has been settled. The remainder of the men, who held out until the final adjustment, have just returned to work. It appears to us most inopportune and untimely to stir up the whole matter again. Had your proposition come at the time of the investigation by the Commissioner of Labor, or during the strike period, such an investigation might have been helpful.” They feared that after four months of “bitter contest” and peaceful relations restored, because there had been no real resolution that the Commission led by Dr. Strong would stir up those bitter feelings again and do more damage than good. The Commission proceeded with the survey, thankfully hostilities were not renewed, but the recommendations of the Commission to the FCC would encourage them to become more involved in labor issues and help fight for better working conditions. The beginnings of this are born out in a letter dated June 10, 1910 from Charles Stelzle secretary of the Commission on the Church and Social Service in which he recommends to the Ministers Association, “the observance of a Labor Sunday on September 4th…and that various ministers preach sermons appropriate to the occasion…” According to Resolution No. 122 of the Toronto Federation of Labor Convention, as part of Labor Sunday “the churches in America be requested to devote some part of this day to a presentation of the labor question.” As a result of the survey the FCC concluded that all Christian denominations should advocate for a higher living wage, passage of Sunday labor laws, reduction of the hours of labor, safe working conditions, an end to child labor, and provision for the old age workers and those incapacitated by injury. Primary source documents mentioned and photographed in this post are contained in a single folder in the FCC Records collection. (Box 2, Folder 3). Fitch, John Andrews, and Russell Sage Foundation Charities Publication Committee. The Steel Workers. Charities Publication Committee, 1911. Web. 23 Oct. 2012. Presbyterian Historical Society. “Federal Council of the Churches of Christ in America Records, 1894-1952.” Web. 22 Oct. 2012. Whelan, Frank. “Steel Strike Of 1910 Wrote Bitter Chapter In Labor History.” The Morning Call: Lehigh Valley’s Newspaper. 10 Mar. 1985. Web. 4 Dec. 2012. This entry was posted in Student Entry and tagged Bethlehem steel, Bethlehem steel strike 1910, FCC, John Fitch, Josiah Strong, WAB on December 4, 2012 by Bree Midavaine.